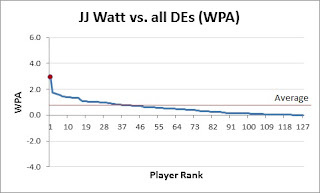 Advanced NFL Stats Community: Should JJ Watt win the MVP award? 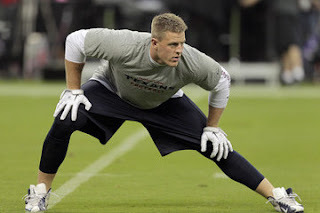 Followers of ANS are probably likely to agree with the notion that JJ Watt is the run-away DPOY for this season, a large proportion of the mainstream media agree, and there is also a very good chance that he will, in fact, win. His main competitors were Aldon Smith and Von Miller who were both originally competing with Watt for the sacks title, but eventually lost out. This shows Watt as a viable contender for DPOY, leading the other two in sacks, tackles and passes defended (where he ranks a ridiculous 10th among all defensive players). However, it is not quite clear cut as the other two both lead slightly better defences and Von Miller has more FF and an interception. Personally, I think the above table shows Watt as the clear winner when put into the context that he is a DE in a 3-4 scheme whereas the other two are both LBs in schemes designed to give them opportunities to rack up the glamor stats. 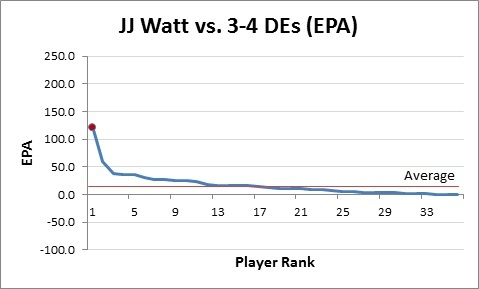 Here Watt completely blows away his competition. 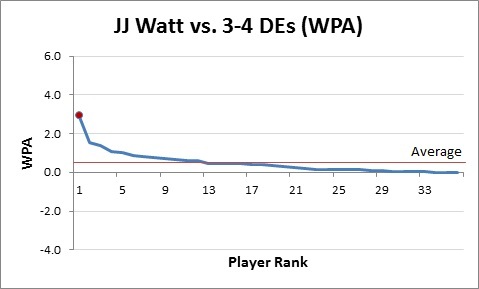 I also added a final column which shows Watt’s advantage over the second place in each category. 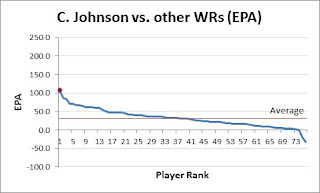 For example, he has 65% more +EPA than the next player (who happens to be Von Miller). That’s insane. It is at this point that we broaden our perspective and consider, not whether he should be DPOY (he should be), but whether he should be the MVP. The Contenders: Generally, the winner of the MVP award is either the QB with the most impressive season, a running back who broke 2,000 yards or a wide receiver who has had some sort of record-breaking season. So this season we have Matt Ryan, Adrian Peterson and Calvin Johnson. 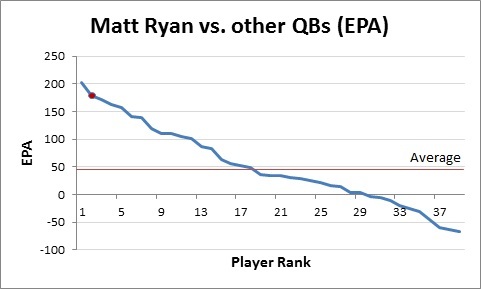 Matt Ryan may seem like a strange choice but he ranks 2nd in both WPA and EPA and is therefore a suitable choice for this analysis. The truth is that I could have easily selected a number of QBs. I am going to dismiss Adrian Peterson now. I am not going to argue that what he has done is not impressive. And even without considering his ACL it is extremely impressive: he lines up every week against teams who know he will run and yet he churned out 2,097 yards at 6.0 YPC. 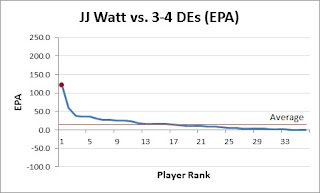 Like Watt – insane. But I am going to use the old argument that a great RB does not translate into wins for his team. Until this changes I don’t think a RB can be the ‘Most Valuable Player’. 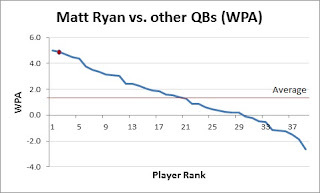 So… back to Ryan, Johnson and Watt. I am going to base my argument based on WPA and EPA only, using the concepts of ‘Above Average’ and ‘Above Replacement’. This compares each player to the average starter and best non-starter respectively. The key is the definition of starter. But of course, we do need to adjust for position. 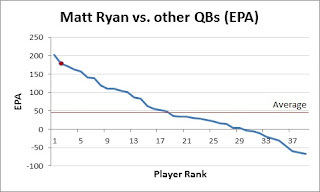 Now for Ryan the definition of starter is easy: the top 32 QBs by either WPA or EPA. The way I did this in practice was to take the top QBs until I had covered 512 (32x16) games played to account for some players getting injured and then replaced with others. 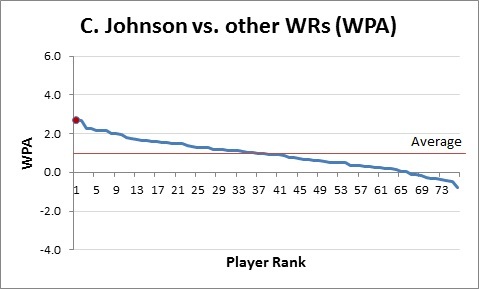 For Calvin Johnson it is slightly harder, but I am going assume that every team plays with 2 WRs most of the time and so he gets compared to the top 64 WRs. For JJ Watt I am going to use two definitions. Firstly, and more restrictive, he should be compared to all DEs that also play in a 3-4 scheme. 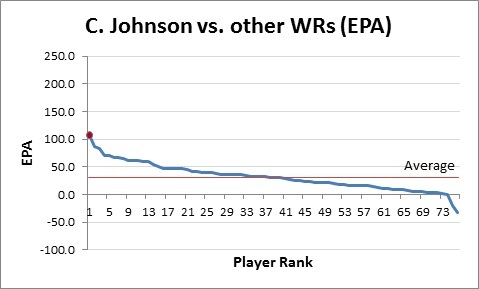 Secondly, he should be compared to the top 64 DEs (assuming two per team). 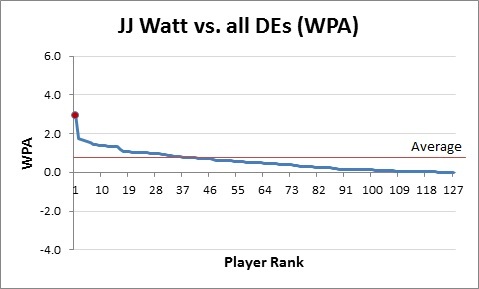 JJ Watt should definitely be in the conversation for MVP. By these numbers, he is ahead of Johnson but quite a long way behind Ryan in, even when we compare him to other 3-4 DEs. 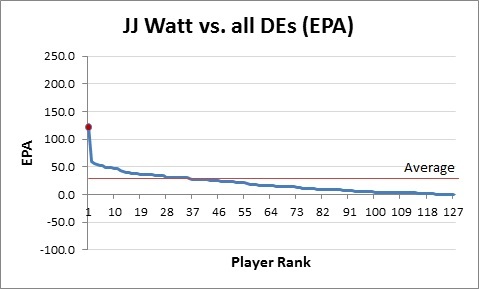 1) The fairest comparison for Watt is probably somewhere between 3-4 DEs and all DEs. When a player is putting up numbers like he is it is fairly safe to assume that the scheme is at least partly designed to allow that player to make big plays. And with a stats like +WPA and +EPA which only count positive contributions, this could make a big impact. 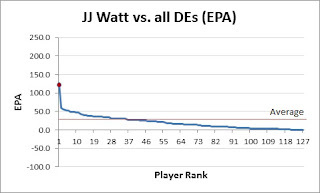 2) Using +WPA and +EPA is unfair against Watt as it does not allow other players to post negative scores. 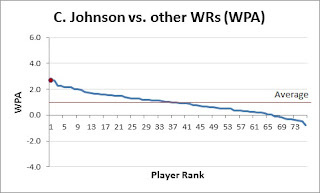 Ryan and Johnson both get compared to players who are producing negative wins and negative points. In WPAR, Ryan gets compared to Sanchez who managed to produce -2.63 wins. 3) Teams try to negate the impact of stars on the opposite team: RBs see 8-9 men in the box, WRs and pass rushers get double- or triple-teamed, CBs never have the ball thrown their way. But a QB has so many options, and so many ways to affect the game that it is almost impossible to target him specifically. 4 The stats of offensive players are often complementary and they rely on the contributions of others. For example, a QB relies on the abilities of his receivers. Defensive players, however, are almost in competition with one another for stats as generally only one can make each play. Taking these caveats into account, I still come to the conclusion that the MVP should be a quarterback but it is a lot closer (personally, I think Peyton Manning should get it, but that’s another story). Watt should at least be in the conversation. As it currently stands, he is not even certain to win DPOY and nobody in the mainstream media would even consider him for MVP. Quarterbacks will always be the MVPs unless we have drastic change to the rulebook. As they touch the ball on almost every single offensive possession, they have the most opportunities to impact the game. But if there was ever a season to give a defensive player the MVP award, this is it. As an added extra – below are the charts for my calculations of WPAR, EPAA etc. 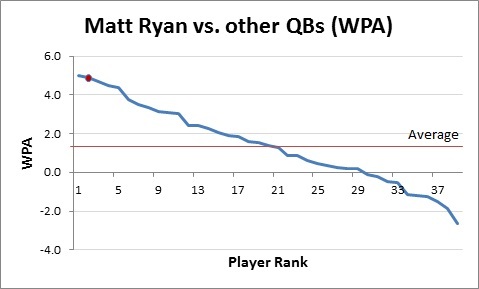 for Ryan, Johnson and both JJ Watt scenarios. 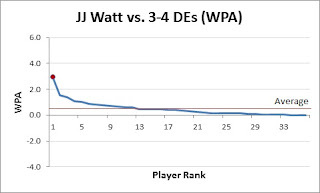 Watt should be fairly easy to spot.